Museum-lovers will get to explore Academy Of Florence Art Gallery and Pitti Palace. 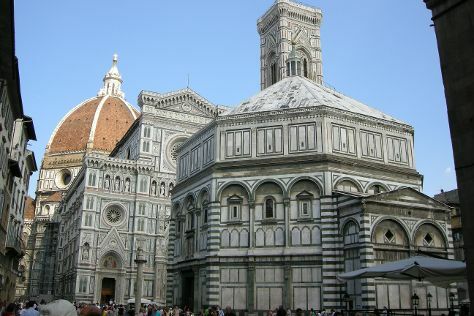 Cathedral of Santa Maria del Fiore and Basilica di Santa Croce are good opportunities to explore the local culture. Venture out of the city with trips to Leaning Tower of Pisa (in Pisa), Siena (Centro Storico di Siena, Complesso Museale Santa Maria della Scala, & more) and San Gimignano (Podere La Marronaia- Sosta Alle Colonne, Guardastelle Vineyard, & more). Dedicate the 23rd (Thu) to wine at some of the top wineries in the area. The adventure continues: admire the masterpieces at Uffizi Galleries, view the masterpieces at M.G. Design, take in panoramic vistas at Campanile di Giotto, and admire the natural beauty at The Boboli Gardens. For maps, photos, traveler tips, and more tourist information, you can read our Florence trip itinerary maker tool . If you are flying in from Spain, the closest major airports are Peretola Airport, Pisa International Airport and Bologna Guglielmo Marconi Airport. In May, daily temperatures in Florence can reach 25°C, while at night they dip to 13°C. Finish up your sightseeing early on the 10th (Mon) so you can travel back home.